Since appliances can add up to 15 to 20 percent of overall energy usage and operational costs to your home, it is a good idea to purchase all energy-efficient appliances for your new home. Whether it's a small appliance like a mixer or microwave or large appliances like refrigerators and washer and dryers, be sure all your appliances are energy-efficient. All major home appliances, except for ranges and ovens must meet appliance standards set by the U.S. Department of Energy (DOE) and carry the black and yellow EnergyGuide label. The EnergyGuide label gives you two important pieces of information you can use to compare different brands and models when shopping for a new appliance: estimated consumption on a scale showing a range for similar models and estimated annual dollar operating costs. You can expect to find these labels on refrigerators, freezers, dishwashers, clothes washers, microwaves, water heaters, pool heaters, room air conditioners, central air-conditioners and heat pumps, furnaces and boilers and fluorescent lamp ballasts. Although televisions, clothes-dryers, ranges and ovens, and space heaters have to meet federal minimum efficiency standards, they were exempt from the EnergyGuide program because the amount of energy these products use does not vary substantially from model to model. Everyone is familiar with the blue and white logo featuring a star (ENERGY STAR®), which is designed to promote efficient energy usage in homes and businesses. The ENERGY STAR® program is a joint effort of the U.S. Environmental Protection Agency (EPA) and the DOE. Home appliances that earn the ENERGY STAR® exceed the efficiency of the federal appliance standards by 10 to 40 percent. You can visit ENERGY STAR® (www.energystar.gov) to learn more information about home energy efficiency, including special offers or rebates and a list of ENERGY STAR® qualified appliances. Once you know what labels to look for and what they mean, you can start to research and select your major appliances like the refrigerator, dishwasher and washer and dryer. Your refrigerator probably uses the most energy of any kitchen appliance, but thanks to new designs and technology refrigerators are much more efficient than its predecessors. Choosing the right size, configuration (top freezer, bottom freezer and side-by-side) and features such as icemakers and water dispensers will greatly influence how much energy your refrigerator uses. When comes time to selecting your dishwasher, you'll want to make sure the model has an Energy Factor (EF) that is at least 0.65, which makes these ENERGY STAR® dishwashers 41 percent more efficient than federal guidelines. Most dishwashers are available in a standard 24-inch, 18-inch compact and a 30-inch model so you can choose the right size dishwasher for you and your family. Look for a dishwasher with cycle options such as light, short or energy saver and use the air dry cycle whenever possible. While there are no efficiency standards for ranges, ovens, cooktops or microwaves from the federal government, they use less energy than refrigerators and freezers which run 24-7 and dishwashers, which use both water and electricity to operate. A glass-fronted oven allows you to check on food without opening the door and letting out heat. Self-cleaning ovens have more insulation making them more energy efficient. 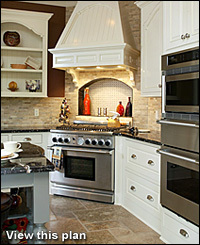 Gas ranges and ovens are slightly more efficient than electric models. If you purchase an electric range or cooktop, look for burners that use halogen elements under glass rather than traditional coil elements or solid disk elements. Induction cooktops use less energy than both traditional electric cooktops and gas cooktops. ENERGY STAR® qualified clothes washers are energy efficient, good for the environment and easier on your clothes, your pocketbook and your schedule because they incorporate technology that adjusts for load size and water temperature. Since they are also designed to extract more water than conventional clothes washers, you can run shorter drying times.